Life changes in the summer. Some people have their kids home from school. Whether the kids are underfoot or attending summer programs, schedules change. Some people change location, traveling in the welcoming warmth of the season. Gardens demand attention (unless you are nurturing a maintenance-free weed jungle). Farmers’ markets tempt with a bounty of fruits and vegetables, easing the transition to lighter meals. For me, June means renewing my “Crazy Mom” title. I am not even kidding. Now that my kids are young adults, there aren’t as many opportunities for me to go overboard with onlookers rolling their eyes and shaking their heads. To remedy that, I seem to have started a tradition last June which renews my coveted “Crazy Mom” title for another year. My 21 year old son just completed his junior (!) year of college in Chicago. As an end-of-the-school-year celebration, before summer quarter classes or jobs begin, he and some buddies drive from Chicago to Manchester, Tennessee for Bonnaroo. Think modern day Woodstock. Four days of non-stop concerts while camping on an organic farm with 30,000 other music festival enthusiasts. My role in this pilgrimage is to enable my son to drive (12 hours!) by giving him my car. Here comes the Crazy Mom part. Tomorrow I will drive the six hours to Chicago, turn over the keys (plus a quick hug, words of advice, and best wishes) and spend the night in a hotel before taking Amtrak back to Saint Louis the next day. Then, next Tuesday, I will make the return train trip to Chicago to help my son move into his summer housing and retrieve my car. At some point, when I have exhausted my motherly helpfulness, I will drive home. Surely right about now you are rolling your eyes and muttering, “Crazy Mom”! All of that driving, mine and the Bonnaroo guys, requires snacks. The snacks have to be melt resistant and likely to stay fresh for the week. Gooey chocolate fingers on the steering wheel are undesirable. Consequently, most of the munchables will be supermarket goodies, but a few homemade treats are required to cinch the Crazy Mom title. These Lemon-Lime Bars will be savored across numerous state lines. 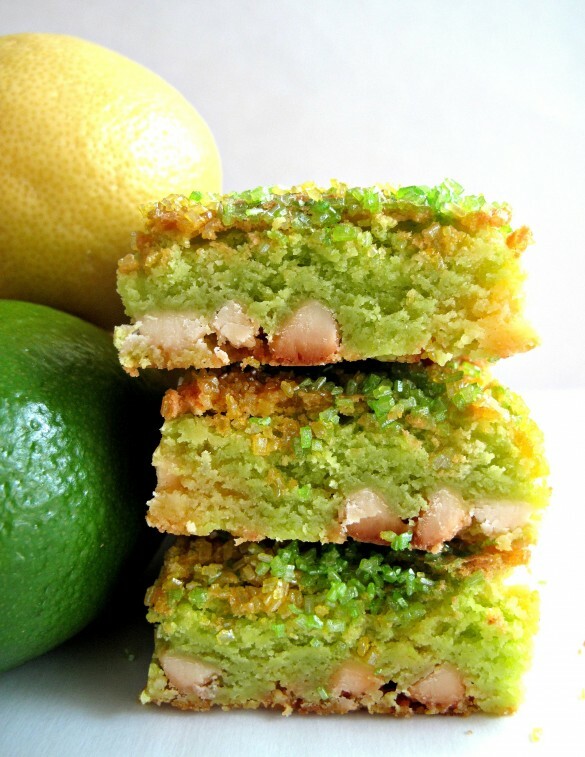 Lemon-Lime Bars are based on my desert safe Lemon Bar recipe. Adding lime ups the citrus fresh flavor. For visual appeal, a few drops of gel food coloring (totally optional) create a lemon-lime swirl. The bling-y colored sugar makes an impact on the pretty factor too. Wondering where I found decorating sugar to match the batter? I didn’t find it. I easily made it! One half cup of white decorating sugar mushed around in a ziplock sandwich bag with 1 drop of gel food coloring, produces any color decorating sugar you need! White chocolate chips add sweet, creamy vanilla to the bars. I found Guittard Vanilla Milk chips at World Market for the same price I pay for Ghirardelli at the supermarket. I couldn’t resist trying them. 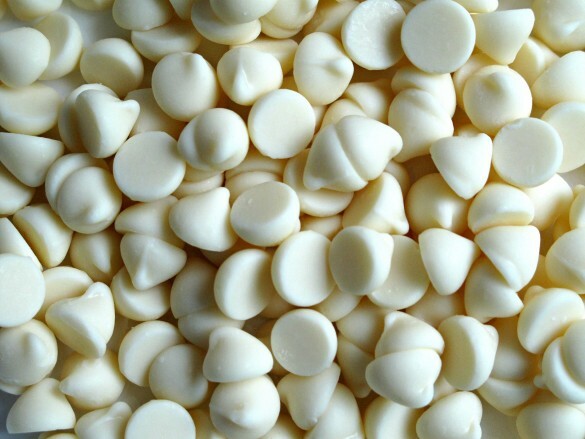 The flavor, so vanilla, and the texture, so creamy and softer than other white chocolate chips, are wonderful. I am going back to buy more. However, perhaps due to the different texture, the Guittard chips overcooked a bit when I baked these bars for the usual 25 minutes. It was a good flavor, like caramelized white chocolate, but the chips hardened slightly. If you prefer a traditional white chocolate chip taste and texture, I suggest using Nestle’s or Ghiradelli white chocolate chips in this recipe. 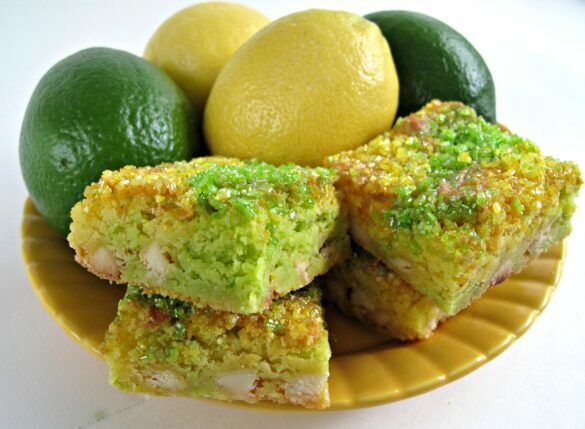 Lemon-Lime Bars are great travel companions for summer road trips or picnics. 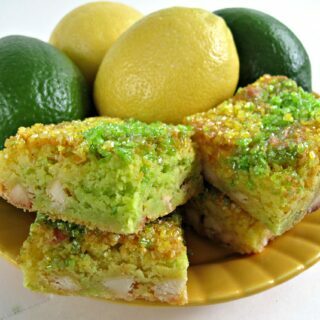 Long lasting freshness make Lemon-Lime Bars perfect for adding some citrus zip to care packages too. You can read more about desert safe ingredients and find an index of all of the desert safe recipes on The Monday Box by clicking here. Preheat oven to 350 degrees F. Line a 9” x 9” pan with foil extending over the edges. Spray the foil with non-stick spray. In a medium bowl, whisk together flour, baking powder, salt. Place vegetable shortening in large microwave safe bowl and microwave about 1 minute until melted. Into the bowl of melted shortening add flour mixture, sugar, eggs and yolk, and vanilla. Mix with a large spoon until smooth. Remove 1 cup of batter and place in a medium bowl with lemon zest, lemon juice, and yellow food coloring. Mix until smooth. Stir in ½ cup of white chocolate chips. To the batter remaining in the large bowl add lime zest, lime juice, and green food coloring. Mix until smooth. Stir in ½ cup of white chocolate chips. Place spoonfuls of batter into the prepared pan, alternating colors. When all batter is in the baking pan, use a knife to spread batter up to all edges. Then run the knife up and down the length of the pan to create a marbled effect. 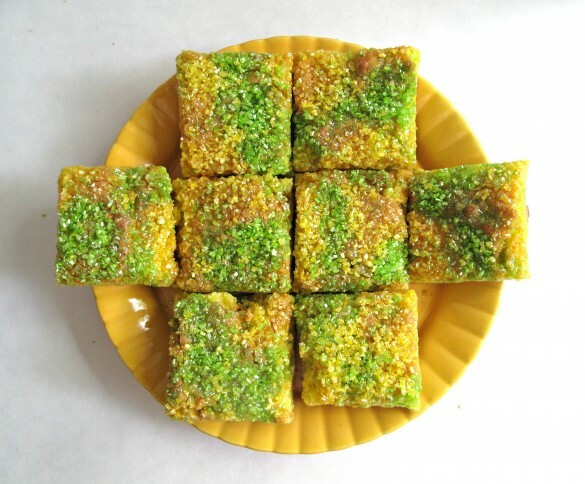 Sprinkle the decorating sugar, in a random pattern of colors, until the top of the batter is completely covered. With fingertips, press the sugar gently to make sure it sticks to the batter. Bake for 25-3) minutes until just golden brown and a toothpick inserted in the center comes out clean. Cool completely in pan on a wire rack. When cool, remove from pan by lifting the overhanging foil. Store at room temperature in an airtight container or ziplock bag for up to 2 weeks. Double wrap bars individually or in pairs in plastic wrap before placing in airtight containers or ziplock bags. For longer shipping times, I recommend not cutting into individual bars, but double wrapping the entire square to help keep the chewy texture as long as possible. I don’t know if you’re a crazy mom, but you’re definitely the world’s nicest mom! I hope you tell your son how lucky he is multiple times a day. 🙂 These bars look great, too! Thanks, Elizabeth! I find that, for me, there is a very fine line between “nice” and “crazy”! 🙂 My son almost never asks for any help or for any material things. So on the rare occasion that I can offer assistance, I try my best to do so. 🙂 I may not sleep or breathe while he is on his adventures, but that is a whole other kind of crazy! 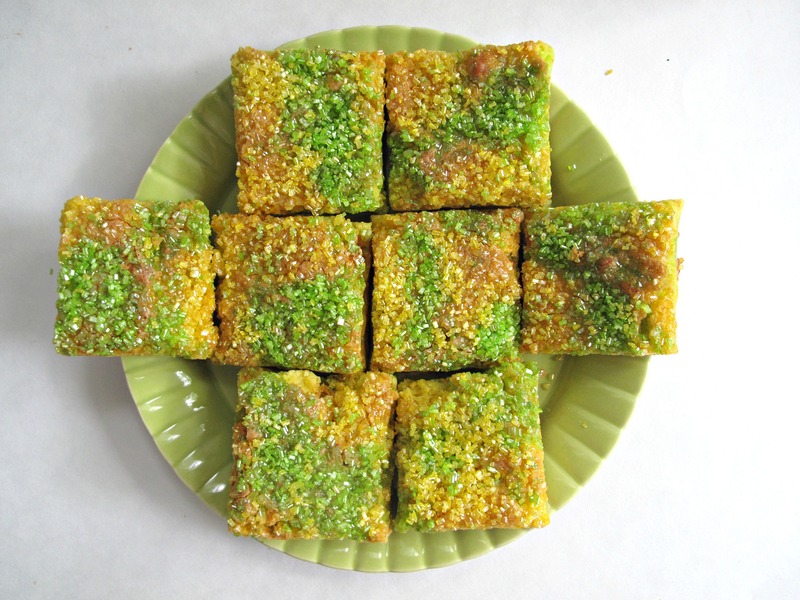 Stress eating a pan of lemon-lime bars is likely. Thanks, Jess! Citrus just tastes like summer, doesn’t it?! You are a wonderful mom! I used to live in Chattanooga and we avoided driving north under all circumstances when Bonnaroo was going on – total gridlock on the freeway! Hope your son has a wonderful time – I know he will enjoy these lemon-lime bars from his crazy mom! these bars are so cheery! And congrats to your son for getting through yet another year of college: good for him! You know, i just talked to my sister yesterday, and she’s getting ready to head to bonnaroo as well, and it looks like the weather may turn out NOT swelteringly hot like it normally is. yay! 🙂 hope everyone has a safe drive and a great time. Thanks, Shannon! I honestly can not believe that my son will be a senior! Hang on to the Wee One in a giant hug. The world is spinning fast and time is flying by! Next time you are at World Market DEFINITELY pick up a bag of the Guittard white chocolate chips. They are crazy good right from the bag and they caramelize when you bake them! I know you will create something amazing (probably including an esoteric spice in the recipe 🙂 ) Bonnaroo fans somehow have a marvelous time in all kinds of weather. How novel for the weather to actually cooperate! You are one awesome mom! And you definitely need snacks for all that driving – these bars sound amazing. I made lemon lime cookies a year or so ago and lovedddd them. I need to make these now – love the addition of the white chocolate! You are an outstanding mom! I love this story. My oldest son also asks for very little, so when I can do something for him, I am also thrilled to help out. The white chocolate chips caramelized in the oven and you created your own blonde chocolate. These bars sound so delicious. I love the combo of lemon and white chocolate, but never considered adding lime as well. Thanks, Monica! As moms we just do what we can to be there for our kids to the best of our ability. We constantly do things we didn’t think we had it in us to do! 🙂 ( For me, that started on day 1. I definitely didn’t think I had it in me to give birth! Somehow, I did it twice! Talk about crazy!) I find that the older I get, the faster time goes. Rather scary really. I have no idea how my son can be a senior in college already! I too am glad we all find time to play in the kitchen and share the fun with the blogging community! Oh yum. I love lemon desserts and am beginning to like lime more than I used to. These look fabulous. Thanks, Micha! I made these bars with lemon only (https://themondaybox.com/2013/05/17/chewy-white-chocolate-lemon-bars/) and loved them! 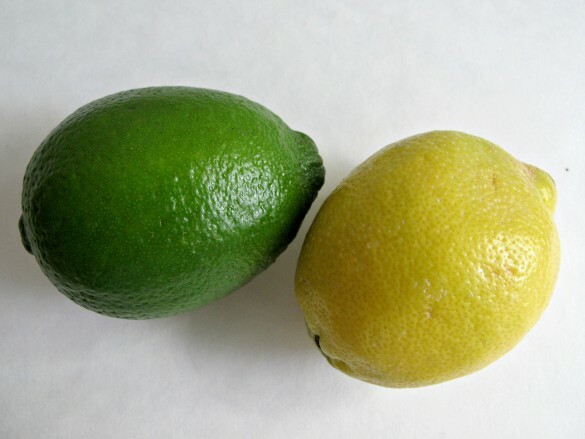 Lime, a favorite of mine, gave the original recipe a extra flavor twist! Thanks, Cassie! They are soft and chewy and full of lemon-lime flavor! Awww you are a GREAT Crazy Mom!!! And these bars are awesome! I’ve never seen bars like this! Love all the color & lemon lime happy going on here. Enjoy your stay in Chicago! These sounds really yummy and should taste just as good too! Oh my these look decadent! I have had lemon bars before, but never lemon lime. Yummers! Thanks, Vicky! 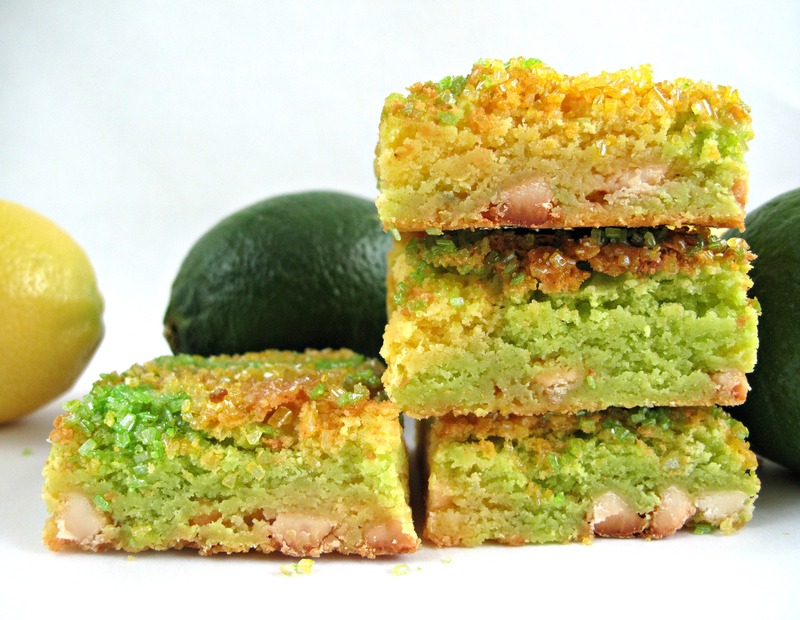 I love lime so much that I almost made these into lime bars! Next time. 🙂 This time the lemon-lime combo was pretty and delicious! Well I am muttering, “crazy mom”, but that’s exactly what I would do too. People roll their eyes at me all the time. I bet your kid loves you a lot! Thanks, Sheryl. 🙂 Let them roll their eyes. Our boys talk to us. That’s more than worth any crazy mom efforts! Its a gift I am so grateful for! Thank you, Kelly! You are very sweet. 🙂 These are my favorite fruity-creamy bars. So many flavors would work with these but lime is a personal favorite! Aww I think that makes you Mom of the year! Not crazy mom. That’s a lot of driving! Does Pax keep you company? 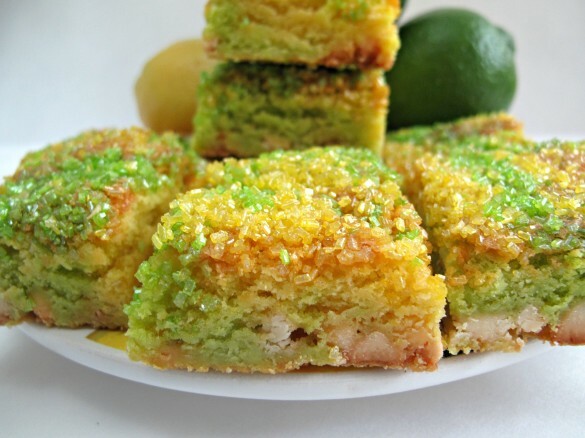 Anywhoo these citrus infused bars sound wonderful! I’d make a double batch for road tripping. How lucky is your son! I agree with Reeni about getting the award of Mom of the year. These bars definitely look gorgeous! I imagine how they are packed with lime flavor and can’t stop my mouth watering! I soooo wish I could have a piece right now! That is quite the elaborate plan just to give your son a car to drive to TN! The past several years, my brother, who is 2 years older than your son, went to Bonaroo and he loved it! Wonder if they saw each other…actually where did he go to school in STL? My brother and I went to John Burroughs. No car trip would be complete without the required snacks! I love these bars! They sound delicious and perfect for car trip snacking…minimal crumbs and sticky fingers! Why are you so amazing?!?!?! Ok, granted, my parents did a lot for me growing up, mainly in the area of working their asses off at their jobs to put food on the table and a roof over our heads. But in terms of spending the time and effort to drive six hours, bake me treats and then help me move?! No way. You are super woman! And these lemon lime bars are making my mouth water. I’m actually wiping drool off of my chin right now!